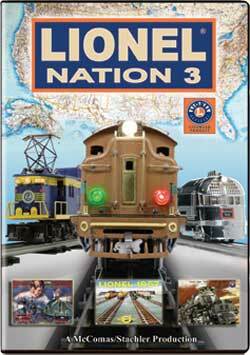 The Lionel Nation Series spotlights outstanding toy train collections and layouts across America. Las Vegas is our first stop, and Steve Garofalo's faithfully accurate reproduction of Lionel's 1957 Super O Showroom Layout. Steve's layout was so impressive that we decided what happens in Vegas can't stay in Vegas. So we filmed every detail and put together a segment for anyone who ever wished they had seen the most famous layout Lionel ever built. Thanks to Steve, that wish is granted. Next stop is Dallas, Texas where we met Roger Farkash, the main man at T W Design. T W Design created the splendid Lionel Christmas displays at FAO Schwarz, Macy's, and Grand Central Terminal featured in Lionel Nation, Part 1. T W Design's latest layout is an incredible 36-trains-in-action display that Lionel takes to train shows. This segment might be your only chance to see a 21st Century Lionel layout that could become as legendary as the 1957 Lionel Showroom. We will also give you an exclusive behind-the-scenes look at how this incredible new layout was made. Portland, Oregon is the home of a great photographer, Fritz von Tagen. Fritz has built a new train room and a new T-rail layout, and like anything Fritz does, it is perfection. Get some fresh ideas about designing the train room of your dreams, and applaud Fritz on his exciting T-rail layout. We always learn something new from Fritz, and so will you. Last stop� Lionel Trains. We cover Lionel's Postwar motorized units, Lionel's scale model of the Pioneer Zephyr, and you'll see the Postwar originals of Lionel's next wave Conventional Classics, plus a lot more. Bonus � First look at Lionel's new model of Grand Central Terminal. Join us for an action-packed journey filled with Lionel trains. All Aboard!! Steamboy (Revere MA US) on 2017-05-08 13:09:55. This 2009 DVD features lots of great layouts from the past to the present. Plus the 2nd part of Lionel's conventional classics which were featured in the new 2009 volume 1 catalog, but it has been equipped with a new electronic horn and bell. As well as the story of the CB&Q's pioneer zephyr with Lionel's model, and some rail scenes with the new model of grand central terminal.